I felt conflicted about how to write this post. My previous two posts on Gaoping’s peasant tourism association and organic food cooperative were easy, feel-good, ‘hooray-for-rural-alternativist-values’ stories of grassroots cooperative institutions that integrate the needs and interests of the local residents while they work together to contribute to the development of their rural communities. The e-commerce shop is a threshold into the globalized world of online shopping transactions. Isn’t that almost the exact opposite of grassroots community development, with inevitable diminishing returns for local, small-scale producers as neighbors turn to purchasing cheaper products online? How is ‘Ms. Lin’ who sells blankets out of her van when not tending to her noodle plot of land supposed to compete with Alibaba*, who controls 80 percent of ecommerce in China, and Amazons’ sloshing troughs of cheap online goods? Well, duh, the e-commerce shop isn’t just for buying stuff, but also selling it, so she can sell her blankets online, right? Except even more concerning (for some) than the role of giant online retail in the everyday lives of consumers is the monopsonist control they may exercise over their online suppliers – sometimes wielding pressure in dubious forms to keep vendor prices low or increase their cut of sales (see Paul Krugman’s recent critique of Amazon here, and a parallel critique of Taobao, who is owned by Alibaba, here). Golly gee if only we lived in a world of insulated self-sufficient communities and I was six years old again and the biggest question I wanted to answer was how many chickens I could carry on my lap while swinging on the backyard swing set. Obviously my simplistic duality of poor Ms. Lin vs. big bad e-commerce capital reeks of some luddite-peasant-preservationist agenda, a veneer as equally nefarious as the modern liberation narrative of the peasant shackled to the land by the big bad state, straining to break free from their feudal obligations and fully emerge into an urban industrialized capitalist society. I bemoan both narratives: e-commerce can undoubtedly improve the quality of rural livelihoods at the same time that online retail platforms, absent state regulations, can abuse their suppliers and consumers via monopolistic and monopsonistic control. With those pesky bifurcations of the peasant vs. big capital and peasant vs. big state out of the way, in China’s geographic tug-of-war between the city and the countryside E-commerce shops can fulfill an important role in rural community development. Let’s explore it. Gaoping, as I’ve described in the past posts, is settled high in the mountains, about two and a half hours from the county seat; so not only is access to products limited, but basic infrastructure is still developing. Through collaboration and investment between the village committee and the township government the e-commerce shop was established in January 2014 as one of many building blocks to overcome local development challenges, including internet access and transportation. 1. 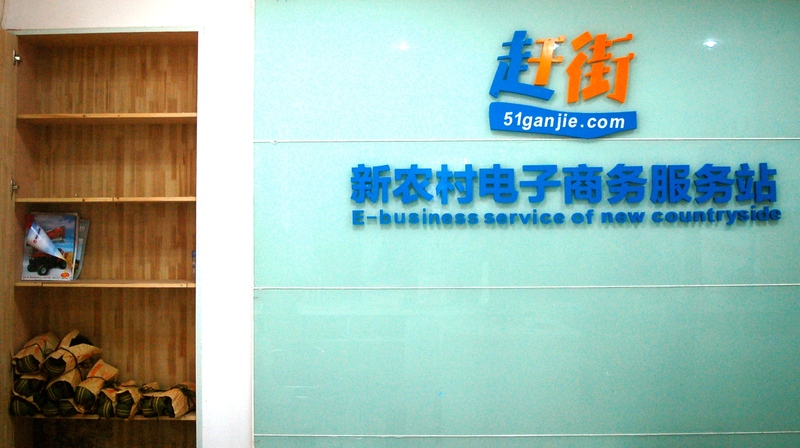 Assistants help villagers, free of charge, to order products online through a site called 51ganjie.com. The site is owned by Alibaba and specifically designed for the countryside. 2. They help villagers sell products online nationally; these include rice, bamboo shoots, tea, dried sweet potato, black ear fungus (a type of mushroom), and chicken. Additionally, they help villagers pay bills online – including water, electricity, and cable; and they help them purchase train tickets (in the past, without internet access you would have to travel the 2.5 hours to the county seat to purchase train tickets). 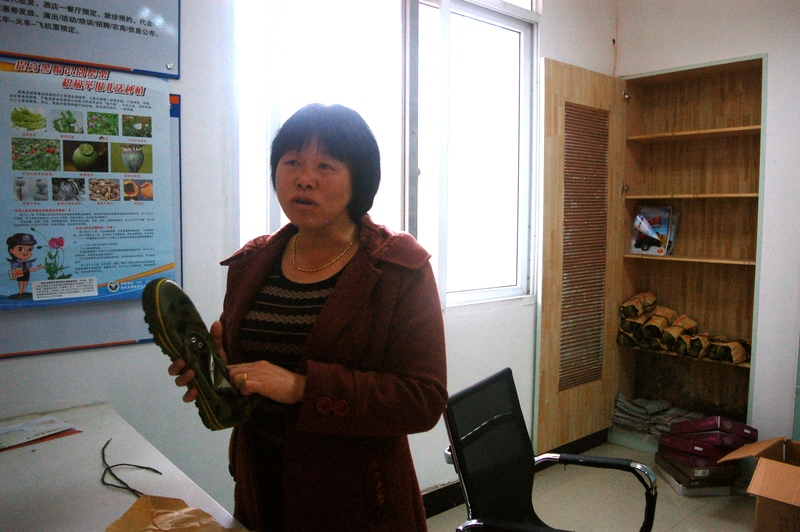 If there is a product many farmers will want to purchase – such as the military style shoes in the photo above that are good for hard labor and work in the fields – the shop will help farmers place their order in bulk, enabling them to them save on the cost of transaction and shipping. Shipping, even more than online shopping access, is the core of the shop. Previously, Alibaba’s consumer-to-consumer site, Taobao (so the e-bay equivalent), would only ship to the county seat, or in some cases they would charge a much higher fee to go down to the village level. Now, through the e-commerce shop villagers can order products that will be shipped directly to the shop. Moreover, if villagers want to start their own business and sell products online, they can ship these products out from the shop as well. So how, exactly, do villagers sell their products online? If anyone has tried selling stuff on ebay, you may know the difficulty of what can be involved. How do you price it right? How do you arrange the transactions and make sure your account is safe? And perhaps most important, how do you make yourself visible? On the Taobao website, clusters of shops are all labeled under their province in China. However, instead of falling under the ‘Zhejiang’ tab, Suichang County is displayed with their own label on Taobao’s site, meaning their visibility to consumers is equivalent to that of a province (for reference, China has 2,862 county-level divisions and 34 provincial/administrative division, so the benefits are obvious). Suichang was able achieve this level of display on Taobao’s site through a business association of online shops in the County seat (score for small business organizing!). The association is composed of 3000 small shops, and these businesses had become so successful that together they approached Alibaba (Taobao’s parent company) to ask for support and sponsorship, and thus became the first county-level cluster of online shops on Taobao. Gaoping’s 51ganjie.com is one of the shops within that cluster. The man who started this business association in Suichang began by selling his own agricultural and organic products online, and, recognizing that there were so many local products of value that were meeting the needs of the market, he began to train other new shop owners. After teaching individual new business owners how to open shops on Taobao or expand their business, he then began organizing a series of workshops and training sessions. As more and more people connected with each other, they formulated a support system that evolved into the business association. 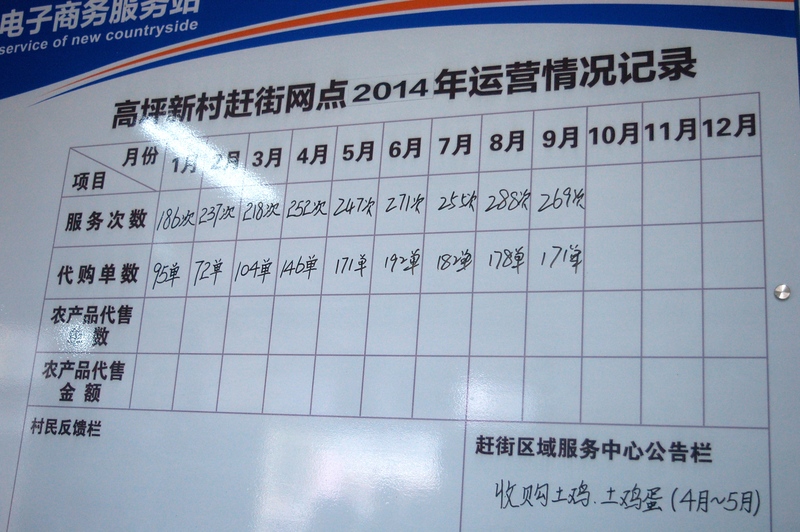 In the photo above, you can see from January to September how many services the shop has provided – in September they assisted villagers 269 times with 171 purchases. Because the shop is so new their services mainly fall on the purchasing side – it will take some time to work together with villagers who want to initiate their own online shops. There are, of course, environmental consequences that will accompany the expansion of China’s e-commerce web via cargo shipping. Perhaps it is time to ask how the richest consumers can start taking one for the team, instead of the poorest. p.s When I was six I wasn’t some swingset-chicken terrorist – I only carried one chicken on my lap. This entry was posted in Zhejiang Province and tagged e-commerce, local government, rural China, social enterprise, Zhejiang. Bookmark the permalink.